Here’s my Monday dinner. Mondays should be special food days, not weekend days. That’s because Mondays are the first day of the week , a great day to be pampered. with yummy, comfort food. For us today it’s gonna be made spaghetti with meat sauce. How to make: Boil the spaghetti in salted water according to packet instructions. Drain, rinse, put back in the pot and add a few drops of olive oil, especially if you are going to store the food in the fridge. In a saucepan, heat the oil or butter and saute the onion and garlic. First the onion, then add the garlic as it takes shorter to saute. Add the minced meat and saute until the meat is brown. Add the wine and cook for couple of minutes to allow the wine to evaporate. Then add the tomato sauce, maybe a bit more water, and then salt, pepper, oregano and the cinnamon stick. Cook for half an hour. Remove the cinnamon stick, pour over the spaghetti and serve. 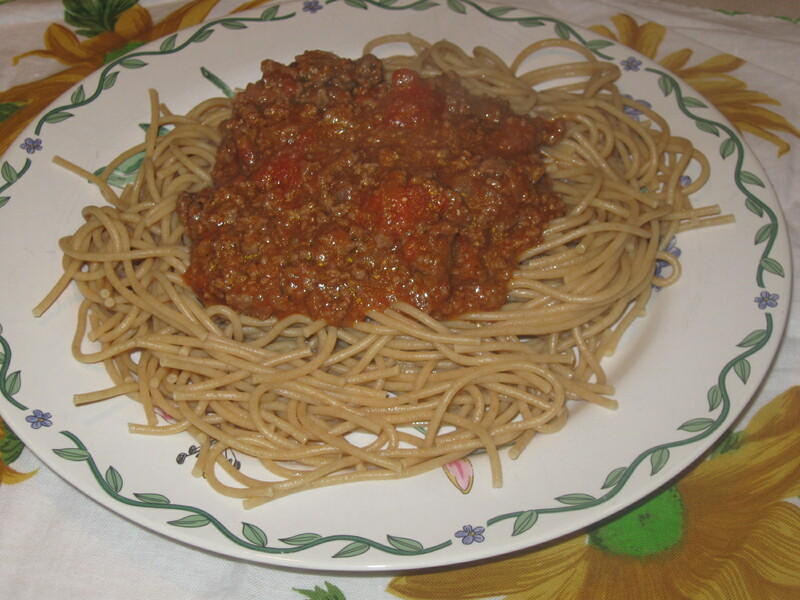 If serving later, keep the spaghetti and the meat in separate containers in the fridge. Combine them and heat them when you are ready to serve. Sprinkle ground Parmesan (or kefalotyri) on top. Notes and tips: I know if you’re Italian I won’t convince you to try whole wheat pasta as its texture and taste are quite different from white pasta. But it’s not too bad, especially served with the meat sauce, and it’s way healthier. This is my very basic meat sauce recipe that my kids adore. Add oatmeal in the sauce for extra fiber. In a different week, I’ll cook Vicky’s hotter sauce which I tried in the past and was great.